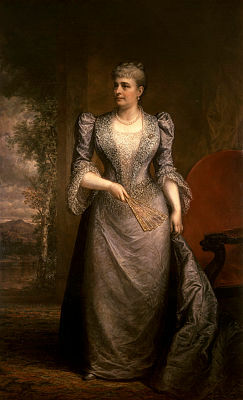 Susan Swain, host of C-SPAN’s special TV series from 2013-2014 on the lives and influence of the nation’s First Ladies, described Caroline Harrison as “one of the more underrated” First Ladies. 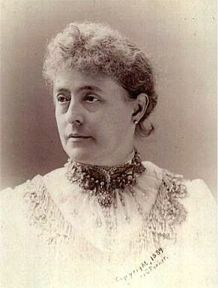 Caroline Harrison, wife of Hoosier President Benjamin Harrison, served as First Lady from 1889-1892. Previously cast off as simply a tactful housekeeper, historians now recognize that Caroline did more, including using her influence to advocate for the arts, women’s interests, and the preservation of the White House. 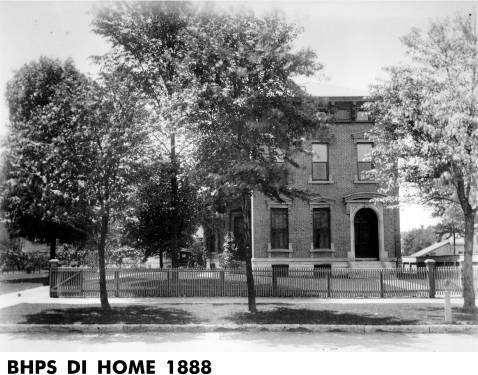 On July 4, 1888, Caroline stood next to her husband Benjamin in the parlor of their home on North Delaware Street in Indianapolis surrounded by guests. Caroline had filled the house with patriotic decorations, including red, white, and blue flags and flowers. However, this was not a normal 4th of July celebration: at the party, Benjamin gave a speech, accepting the Republican nomination for president. For the next four months, their home became the center of Benjamin’s political campaign. Parades marched up and down the street in front of the house Benjamin gave more than 80 speeches on their front porch. On Election Day, the Harrison family waited anxiously for a telegraph operator set up temporarily in a nearby bay window for election results. The next morning, Caroline and Benjamin discovered they had won. The Harrison family was moving to 1600 Pennsylvania Avenue. 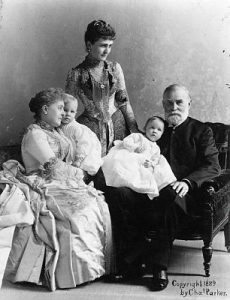 Though the Harrisons had lived in Indianapolis since 1854, the couple’s story began in Ohio. Benjamin had been a student of Caroline’s father at the Farmer’s College in Pleasant Hill, Ohio. Benjamin followed Caroline to Oxford, Ohio. She enrolled in the Oxford Female Institute and he attended Miami University. Soon after they earned degrees, the two got married and moved to Indianapolis. As Benjamin built up his law practice, Caroline became an integral part of Indianapolis’ charity network. Through membership at the Presbyterian Church, Benjamin and Caroline became active in the Indianapolis Benevolent Society, one of the city’s earliest charity organizations. Members were assigned their own district in the city, serving as “donors, fundraisers, friendly visitors and distributors of aid” in their assigned area. During the Civil War, Caroline expanded her efforts, volunteering with various women’s organizations that aided the war effort, like the Ladies Patriotic Association and the Ladies Sanitary Committee. 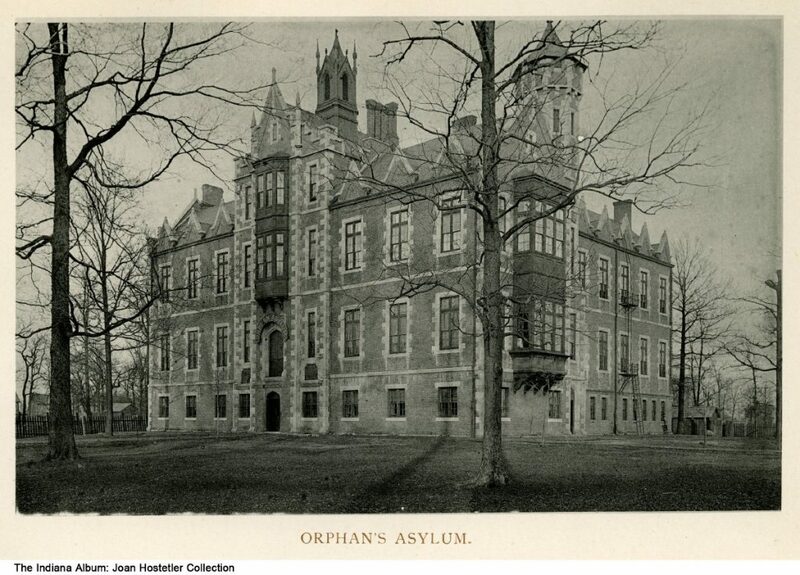 She also started her 30 year long career with the Indianapolis Orphans Asylum, joining the board of managers in 1862. After the war, she became involved with a new charity, the Home for Friendless Women, created to care for an influx of widowed and transient women who flocked to the city after the war. The home operated until 2003, most recently under the name Indianapolis Retirement Home. Throughout the 1870s, Caroline’s reputation as a capable organizer for charities grew. She sat on the board of many temporary relief funds and charitable events. 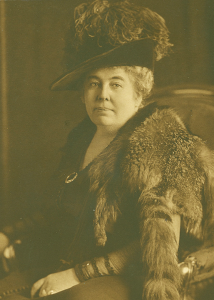 When Benjamin served as Senator, she added a number of Washington, D.C. charities to her roster, including the Washington City Orphans Asylum and the Ladies Aid Society for Garfield Hospital. An avid painter, she also found time to make pieces to display at early exhibits for the Indianapolis Art Association, which pioneered formal art education in Indiana and influenced the development of fine arts in the state. When the Harrisons moved to Washington, D.C. for the Presidency, Caroline worked hard to have impact as a First Lady. 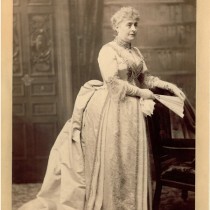 Though her predecessor, the young and fashionable Frances Cleveland made Harrison look old and dowdy by comparison in the press, Harrison became a more publicly active figure than Cleveland had by advocating for the arts, women’s interests, and the preservation of the White House. Four generations of Caroline Harrison’s family who lived at the White House, including her father, her daughter, and two grandchildren. Accessed White House Historical Association. Four generations of relatives moved into the White House when Benjamin took office, which brought the household total up to 12. After the whole family crowded into the White House, Caroline became “concerned over the condition of the house provided for the Chief Executive and his family.” The private spaces for the family amounted to five bedrooms, one bathroom, and a hallway. The rest of the building was reserved for offices and public functions. In addition to the lack of space, the White House had fallen into disrepair. The threadbare carpets, shabby furniture, unwelcome presence of vermin made the White House unsatisfactory to say the least. Caroline reached out to former First Ladies and discovered that previous administrations had struggled with coming up with enough space to entertain and host important foreign leaders and dignitaries. There had been an embarrassing situation during the Buchanan administration where the Prince of Wales and the rest of the royal family could not all be accommodated because of the lack of space. 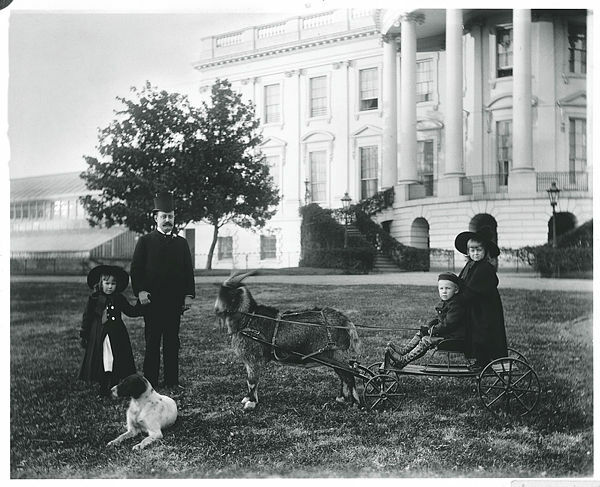 Some of the Harrison family outside the White House, including Caroline and Benjamin’s son Russell and three grandchildren with their pet goat and dog, ca. 1890. Accessed White House Historical Association. We are here four years. I do not look beyond that, as many things occur in that time, but I am anxious to see the family of the President provided for properly, and while I am here I hope to get the present building into good condition. 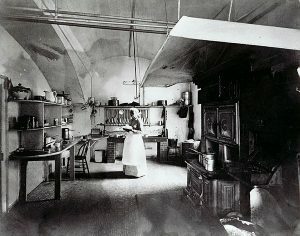 Photo of the White House kitchen, a few years after the renovation in 1893. Accessed White House Historical Association. Despite Caroline’s lobbying, her bill to provide funding to expand the White House did not pass. Though it went through the Senate, it failed in the House because President Harrison had ignored the Speaker of the House’s choice for collectorship of Portland, Maine. However, she did receive approximately $60,000 in appropriations to redecorate and renovate the interior and add the first electric lighting. Throughout her First Ladyship, Harrison directed painting, installing additional private bathrooms, renovating the kitchen, replacing all the dirty and moldy floors, rebuilding the old conservatory, adding greenhouses, and redecorating many of the public parlors. Even the old bits stored away in the attic are to be listed, for Mrs. Harrison is anxious that pieces which have historic value or connection with presidential families of the past shall be preserved. She stopped the old practice of selling off furniture, china, and silver at the end of each president’s administration, not only to save money, but so the historic mansion would maintain pieces from past presidents. Through this process, Harrison laid the foundation for the celebrated White House China Collection. 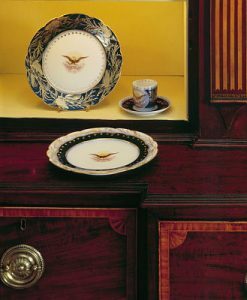 Harrison’s acquaintance, Harriet Foster wrote “she immediately began a valuable collection to be preserved, in cabinets, of the scattered remnants of the china of former Presidents.” She even designed the Harrison china set, which featured corn ears, stocks, and tassels. this government has reached that point where it should give more attention to the fine arts—that is, a judicious expenditure for works of merit. 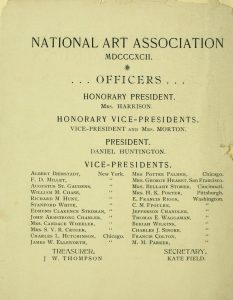 National Art Association Catalogue. Accessed Smithsonian Libraries. 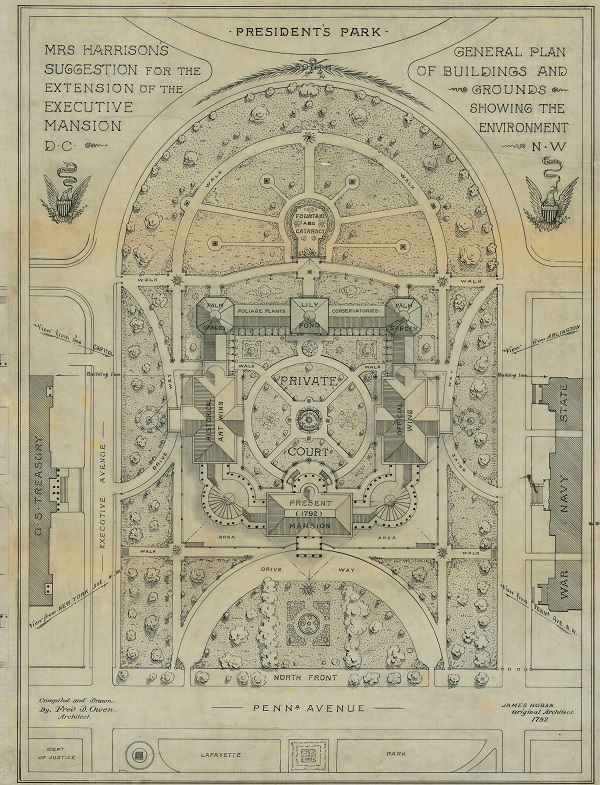 She made sure to include a large gallery of historical paintings in her plans for the White House expansion and supported the addition of paintings to the White House’s fine arts collection, including the first example of a non-portrait piece purchased for the mansion with federal funds. Her plans and actions set precedent for the introduction of a professional curator to care for the White House’s art collection, a position filled during the Kennedy Administration seventy years later. Lastly, in 1892 she became Honorary President of the National Art Association, joining forces with prominent artists like William Merritt Chase and Albert Bierdstadt, to lobby to exempt imported works of art from taxation. The tariff was eventually lifted. Harrison lent her name to other organizations that promoted women’s interests. She agreed to head a local Washington, D.C. committee of women dedicated to securing women’s admission to the new Johns Hopkins Medical School. Johns Hopkins trustees promised five Baltimore women connected to the institution if they raised $100,000 (later increased to $500,000), the school would accept women on the same terms as male applicants. 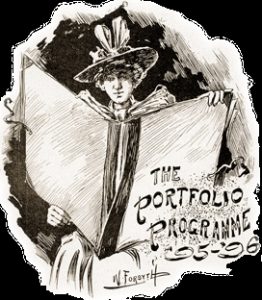 These women began recruiting prominent women across the nation to raise money in their own locales. 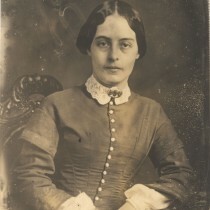 According to historian Kathleen Waters Sanders, Caroline’s agreement to help the cause “was important, lending the campaign credibility and national visibility.” Due to women’s work, the medical school opened in 1893 as the first coeducational, graduate-level medical school in the nation. 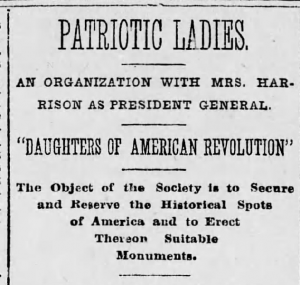 The founders of the organization asked Harrison to lead, hoping her status as First Lady would elevate the DAR, give it credibility, and attract more members. Though she delegated day-to-day operations to other DAR board members, Harrison helped guide the fledgling organization through its early years and helped it become a political force. 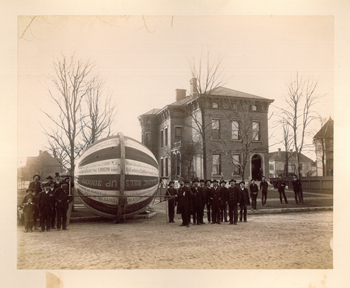 In 1892, the DAR had grown from a handful to over 1,300 members. Since 1890, the DAR has accepted over 950,000 members and served as an important political lobbying group. It has also restored and maintained numerous historic sites and preserved countless genealogical records and artifacts. Unfortunately, Caroline’s career as First Lady was cut short. She died in the White House from tuberculosis October 25, 1892. Benjamin lost reelection soon after. 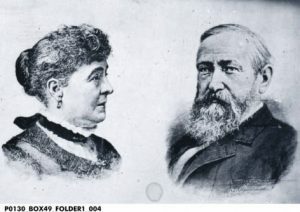 However, a new historical marker at the Benjamin Harrison house in downtown Indianapolis will honor Caroline Harrison’s achievements, both in Indiana and as First Lady. Please check our website and Facebook page for more information about the marker dedication ceremony, scheduled to take place in October. Indiana’s state flag waves from all corners of the state, from the Statehouse to a farmhouse in Selma. It has so proliferated the state’s landscape that it’s easy to assume it has flown since Indiana’s birth. 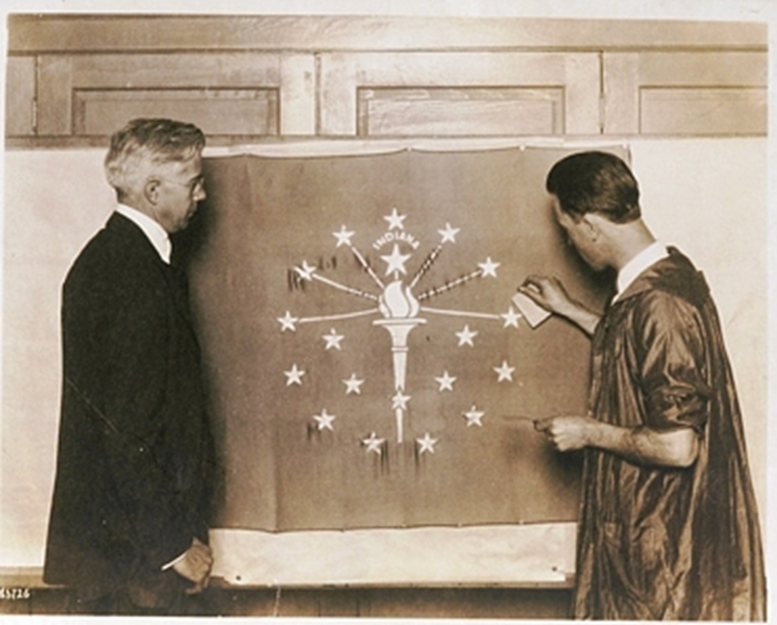 However, it was not until 100 years after statehood that Indiana got a flag representative of the Hoosier people; and it was decades after that before the public recognized the design. We’ll examine why so much time elapsed before Hoosiers proudly hoisted blue and gold from their flagpoles. 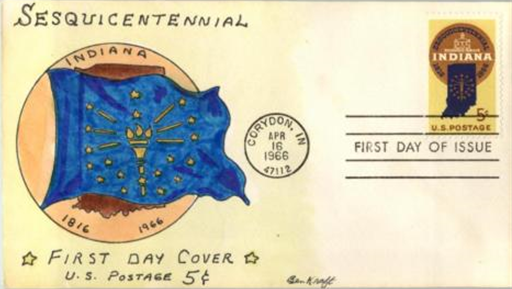 The Indiana Daughters of the American Revolution, and some other patriotic organizations, have decided that it is wholly suitable, and very desirable that the Indiana centennial observance should be lastingly marked by the creation and adoption of an Indiana state banner. [I]s not proposing the creation or adoption of a state flag. There is no disposition to try to share the place of the one flag, but there is a feeling that it is wholly appropriate to adopt an individual standard or banner. Other states—all of them thoroughly patriotic and loyal—have done so. It is difficult to find a motive to be expressed on our banner, as Indiana has no mountain peak, no great lake or river exclusively its own—but it is possible to find some symbol expressive of its high character and noble history. 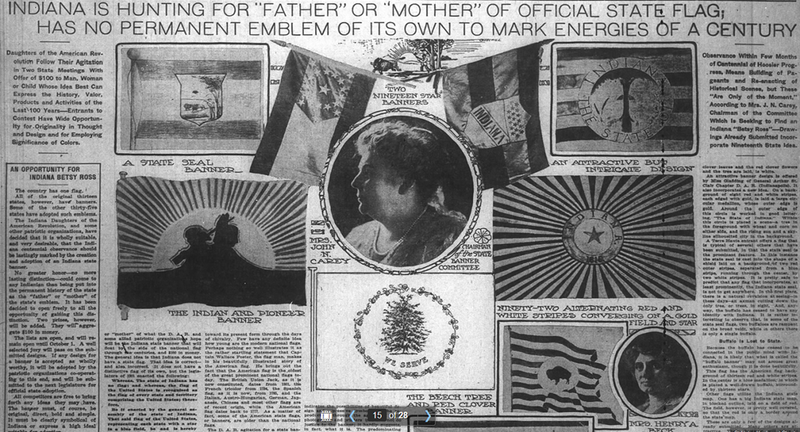 As the banner competition progressed, Carey urged contestants to submit simpler designs that could be “recognized at a distance, and simple enough to be printed on a small flag or stamped on a button.” She encouraged applicants to design banners “striking in symbolism” and utilize colors differing from those of the U.S. flag. Hadley’s submission met these suggestions, featuring a gold torch representing liberty atop a blue background. Radiating from the torch were thirteen stars on the outer circle to represent the thirteen original states, five stars in the inner circle to represent the states admitted before Indiana, and a larger star symbolizing the State of Indiana. (In 1976, David Mannweiler of the Indianapolis News reported that Hadley’s additional submissions in 1916 won prizes for first, second, third and all honorable mention awards. Mannweiler noted that one of the entries included a tulip tree leaf and blossom and another featured an ear of corn with an Indian arrowhead). Indianapolis Recorder, October 1, 1955, accessed Hoosier State Chronicles. 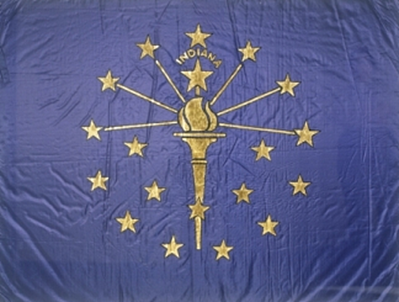 After Hadley’s design was selected, it was submitted to the Indiana General Assembly in 1917 for approval and adoption as Indiana’s official state banner. The legislature ordered that the word “Indiana” be added above the star representing the state. The enacted law stated that the banner “shall be regulation, in addition to the American flag, with all of the militia forces of the State of Indiana, and in all public functions in which the state may or shall officially appear.” So as not to conflict with the 1901 legislation, the U.S. flag remained Indiana’s official state flag and Hadley’s design was referred to as the Indiana state banner. 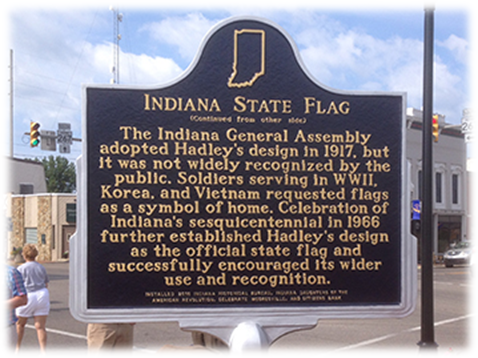 In 1955, the General Assembly approved an act making Hadley’s design the state flag of Indiana. 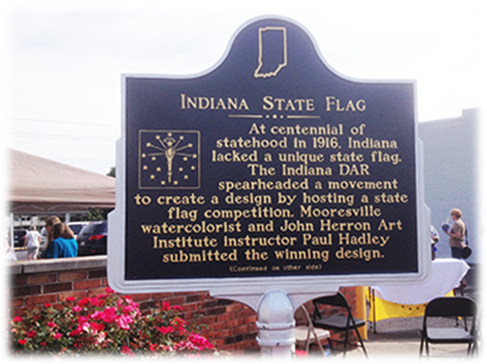 The flag’s designer was born August 5, 1880 in Indianapolis, but spent much of his life in Mooresville, Indiana. Hadley initially attended Indianapolis High School (later renamed Shortridge High School), but transferred to Manual Training High School to study under “Hoosier Group” artist Otto Stark. According to fine arts curator Rachel Berenson Perry, in the fall of 1900 Hadley enrolled in the Pennsylvania Museum and Industrial School of Arts in Philadelphia and studied interior decorating for two years, afterwards working as an interior decorator in Chicago. 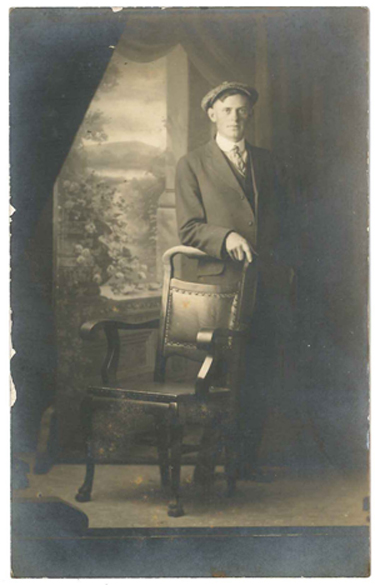 Paul Hadley, circa 1905, (Picture Postcard by J. P. Calvert), courtesy Mooresville Library. Of charming quality and lovely color, a veritable delight as to design and pattern, likewise expressive of poetic feeling and an imaginative faculty that bespeaks the true artist, these pictures form an important series in the beautiful work coming from Mr. Hadley’s brush within the last few years that is indeed distinctive. “House Among Trees,” watercolor on white paper, courtesy of Indianapolis Museum of Art. 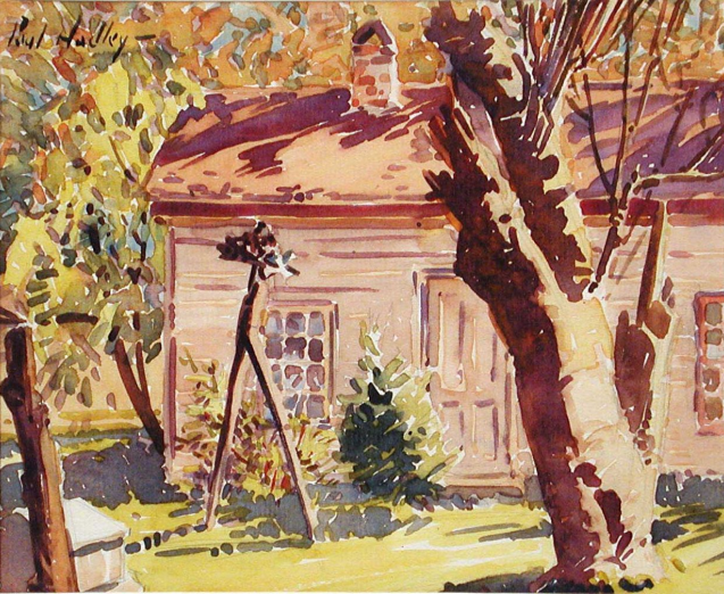 Hadley gained a reputation for his watercolors and frequently exhibited his work in Indianapolis. He participated in Indiana Artist Club exhibitions and belonged to the prestigious Portfolio Club. The Indianapolis Star Magazine and a Hoosier Salon booklet reported that Hadley received awards for his watercolors at the annual Hoosier Art Salon and Indiana State Fair. A 1922 Indianapolis Star article asserted that the winning Indiana State Fair pieces conveyed “freshness of outlook, evidence of fine color sense and a feeling for harmony and balance. His creative ability and versatility are evident in the handling of various subjects in different mediums.” That same year Hadley was invited to teach at the John Herron Art Institute, where Art Association of Indianapolis bulletins show he frequently exhibited watercolors. In 1929, Hadley’s job at Herron transitioned to water-color instructor. According to The American Magazine of Art, a change in school administration in 1933 led to the dismissal of Hadley along with seven other professors, including “dean of Indiana painters” William Forsyth. Hadley transferred to the Art Institute’s museum in 1932, working as assistant curator. 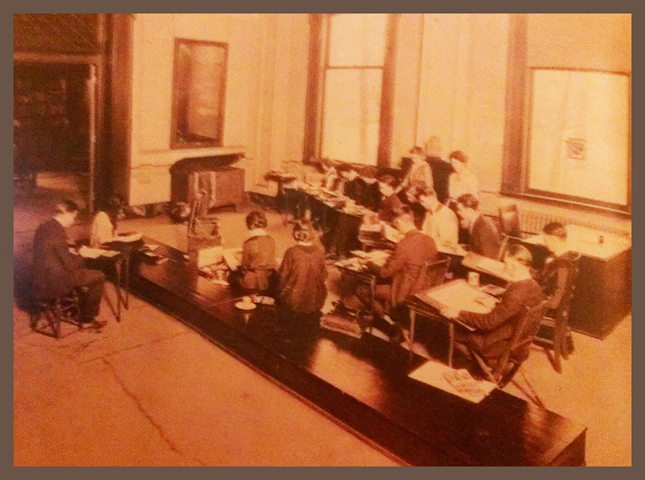 John Herron Art Institute, Students sketching in the lobby of the museum, 1921, courtesy of HistoricIndianapolis.com. there were several of the lawmakers that were not enthusiastic over the proposition for a state flag and Gov[ernor James P.] Goodrich himself thought so little of the proposition that he allowed it to become a law without his signature. 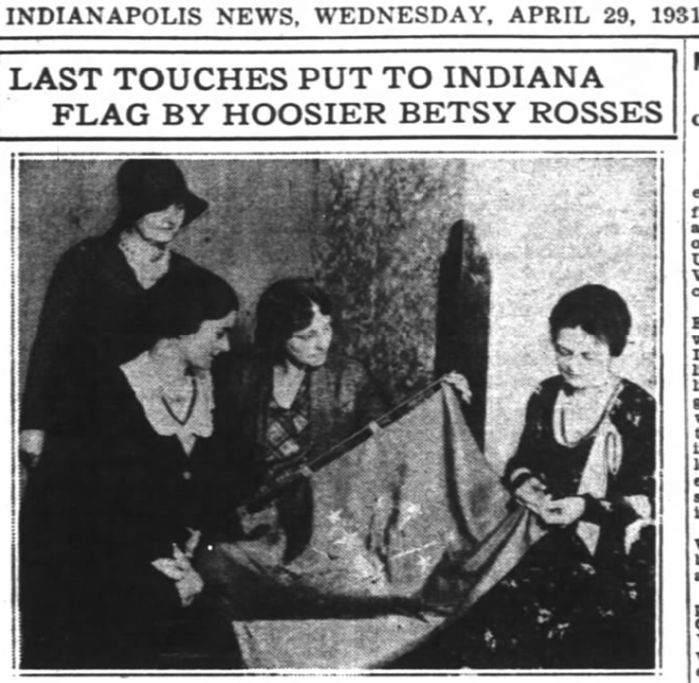 [I]n the four years that have elapsed since the centennial celebration, this flag has never been displayed at a public gathering with the exception of the celebration of the centennial of Indiana [U]niversity, and then, through the instrumentality of a pageant master from another state. It was not seen during the Indianapolis centennial celebration, nor during the recent encampment of the Grand Army of the Republic. . . The flag is not to be found in the Statehouse . . . some one in authority should see that this flag should be manufactured and should be displayed on all suitable occasions together with the flag of the United States. The measures were largely successful in bringing awareness to the flag. 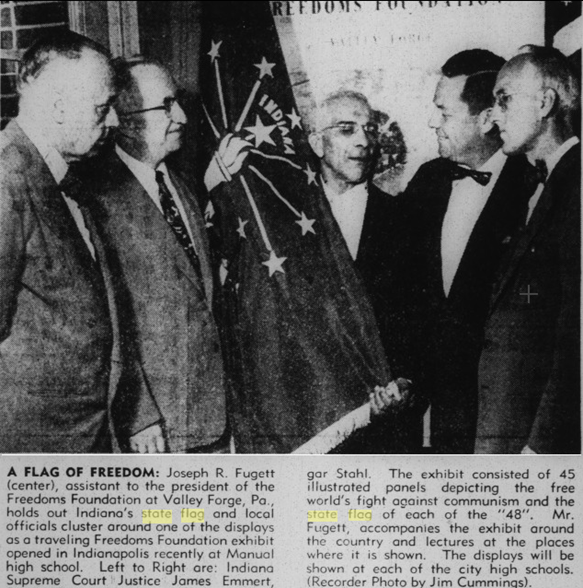 A June 2, 1966 Indianapolis News article reported “almost any school child can recite the significance of the present official flag” and that “today it is known by all public-spirited Hoosiers of all ages.” The Delphi Journal noted that the state flag, purchased by the “Sesqui” group, was on display and would be exhibited at the REMC auditorium. The Tipton Tribune informed readers that the Sesquicentennial Queen would be delivering a tribute to Hadley. The anniversary of statehood was commemorated on a national scale at the Tournament of Roses Parade in Pasadena, California with a float depicting the state flag and other symbols of Indiana. The flag continues to be used publicly to represent and celebrate the Hoosier state, such as its display at the 2015 Statehood Day, an event that kicked off Indiana’s bicentennial celebration. Check out IHB’s new historical marker and corresponding notes to learn more about the flag and its designer. Location: Intersection of E. Main Street and Indiana Street, Mooresville (Morgan County, Indiana).